In the opening game of the Champions Trophy 2013, India and South Africa were in Cardiff, in a game which the Indians outplayed a weakened South African team with a 26-run victory. India posted 331 against South Africa in the opening match of the ICC Champions Trophy 2013. They achieved a decent score courtesy of 3 brilliant innings from Ravindra Jadeja, Shikar Dhawan and Rohit Sharma. Jadeja powered to 47 hitting 7 fours and a six from just 29 deliveries. Rohit Sharma mustered 64 from 81 balls in a classy performance which included 8 fours and a six. But the plaudits went to Dhawan who scored his maiden ODI century off 94 balls, hitting 12 fours and a six in the process, ending with 114. South Africa now chase 332 at Cardiff. 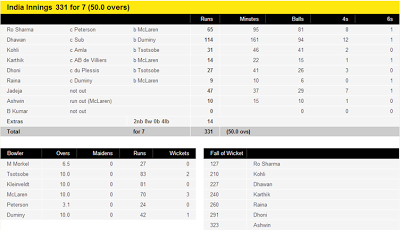 South Africa were bowled all out for 305 runs, despite 71* for McLaren and de Villiers and Peterson adding 124 runs. But the match seemed to be one of which South Africa were to crumble, with sloppy playing things just began to deteriorate throughout their innings. 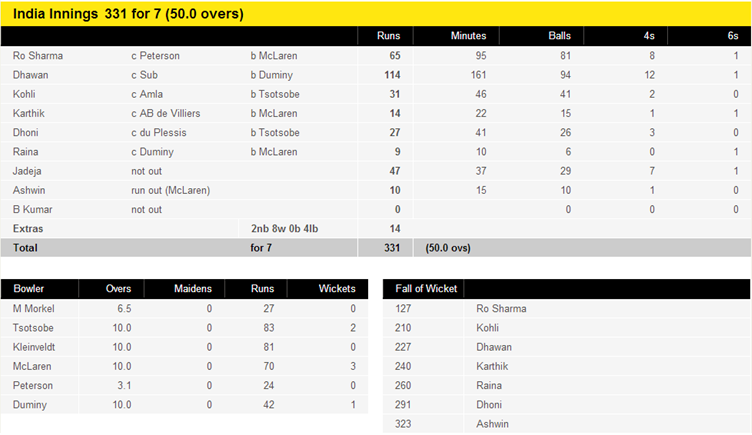 India out-batted South Africa and even surprisingly managed to outfield them too which was part of a great performance. An impressive performance by India that gets them off to a great start in the Champions Trophy. South Africa are a team depleted, but India's performance against them still made a bold statement. South Africa now find themselves in an already-uphill battle while the World Champions have some momentum. Will this be one of many India wins to come? Can South Africa defy the odds and progress? Follow the coverage on The Sport Matrix to find out what goes on in the Champions Trophy.